Hello from my room where I should be sleeping, but . . . Earlier this evening I was fortunate to be able to go to the movie theatre, not something I would normally mention. While I enjoy movies, and particularly ones that force me to think or ponder, seldom to I leave a movie speechless or so amazed there are simply no words to adequately portray what I am thinking or feeling. The last movie to come close to doing that was A Beautiful Mind, which up until this evening, was the movie I have referred to as my favorite. After seeing Selma this evening that designation for the amazing movie about John Nash may have changed. What an astounding movie this look at our country 100 years after the end of the Civil War is painted (pun intended). Poignant, risky, and one that forces all Americans to face our racism, both in our unbelievably saturated history, but also in our lingering overt and covert continued practice of marginalizing those we deem different. I am still processing the movie on a number of levels and will probably see it a time or two more. I have some other thoughts about how I might use it in my classes this semester. I was particularly struck by the way the federal, state and local levels of politics and law enforcement managed the issue of voting. What an eye opening thing for me. I was only 10 years old when most of this was happening, and growing up in an almost totally white NW Iowa, I had very little awareness of these issues. What is amazing to me is how in a time of our national history when we claimed or perhaps appeared to be such a beacon of democracy and equality, we were actually not listening to the nation-wide cries of injustice and our image was barely a veneer of any such place. As mentioned, I grew up in an almost totally white town, even though there were around 100,000 inhabitants, there were very few blacks and probably more Native Americans. I grew up knowing that the “N-word” was not to be spoken, but I do not think I met a black person until I was a senior in high school. Seriously. The re-proportioning of high schools in my senior year meant that most of the black students, which were not many, went to my school. I honestly do not remember thinking they were really any different than I was, but I think that was because I was pretty easy going. The very fact that I might say do not think they were different, however, raises the issue. Why might I consider them different? Why am I even prompted to consider such a question? Going into the Marine Corps was an eye-opening experience because of the racial exposure I would receive. While they argued that everyone was Olive Drab, as I look back that was not true. I have some very painful experiences in the service because of a particular situation with a Black Marine, but that experience was because of who he was as a person and had nothing to do with his race. However, all of this, I believe, forces me to admit, to see as a revelation, the reality of my white bias. It forces me to realize I was raised in a society that saw, and continues to see, “the other” as different, and too often different means less than or somehow problematic. Perhaps this is what Melissa was trying to get me to see more clearly than I was able way back in September when I wrote about privilege. Perhaps I need to give her more credit than I was willing to give. Perhaps it was, because this white bias, I could not see through her words or understand her clearly. Perhaps it is because my emotions got in the way of my brain. That happens more often than I would like to admit. Going to the movie last night I saw things I could’ve never imagined. I thought things I did not anticipate. I thought things the touched my very soul. For me, ultimately, that’s what makes the movie successful. The analytical side causes me to wonder how much directorial license was taken? How much of the script is fictional? Regardless the answer, what I know is it the movie was moving, compelling, and phenomenally effective. I must know it was not until I was lying in bed last night at the irony of seeing this movie on Martin Luther King Day hit me. What an unbelievably apropos thing to do, but I must know that I did it unwittingly and unknowingly. I am never been against a holiday, I must also must admit that I’ve never done much to celebrate it. I should note that it is early Tuesday morning and I’m up and ready for a new semester. I think I will start with breakfast at the diner. Two eggs, hot tea, a half order of potatoes should do it. While I had gained some weight back during the fall have managed to lose all of that in the last 10 to 12 days. That does not really hurt my feelings and, in fact, I would like to lose another 15. That would put me in the 170s. Not a bad thing especially as I’m getting older even as I write. Back to the issue at hand. The movie forced me to think about where our country comes from and what we value. What we say we value corporately or nationally and what we seem to do individually is too often at odds. The portrayal of Lyndon Baines Johnson and his willingness to create a law to ensure voters rights was quite interesting. At least in the movie, up till his very announcement before Congress, he was unwilling to do the right thing because it was not politically expedient. Again how true that might be is probably open to debate, but I also know that he was a political pragmatist and he was from Texas. Even though that is my birth state, it is not a place known for being compromising nor willing to work with another. Hence the billboards “don’t mess with Texas.” I might again reveal a political bias here, but Bush 43 seems to prove that assertion. Again I do not want to be a spoiler in case you want to go and see the movie. 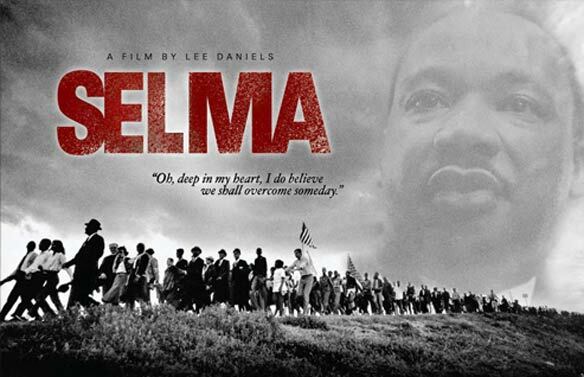 All I can say is regardless of script or directing, I believe the movie provides an unparalleled picture of our world a mere 50 years ago. While it forces me to consider the past, more importantly, it requires me to ponder our present circumstances. Well I’m well aware of the argument that will be made regarding legalities and voting for the black person in the 1960s, I cannot help but see parallels between then and how we now treat Latinos and other minorities in our present immigration debate. Not that long ago, in our own history black people were only counted as 3/5s of a person. What the hell? They were brought here, many against their will and we abused and marginalized them. Too often I believe we still do. I’m not sure that every Latino, Asian or other immigrant child wants to come to the United States, but in order to stay with their family and, often in the hopes and dreams of parents providing a better life, they come. In the big picture, not that long ago, my ancestors did the same. As I noted in the previous blog, we are all immigrants. It does not matter the color, the gender, the creed or faith, is a fundamental human given to hope for good life. If not for ourselves at the very least for our children. It is the very reason I will see many faces, new faces, today in my classes. They are hoping to somehow this investment of tens of thousands of dollars will provide an opportunity for them to be more successful, to make a difference in their own lives and in the lives of those they love. How do we value them as a student? How do they value themselves? Too often their backgrounds cause them to believe they are capable of less than they are. On the other hand, it is not our job to merely hold their hands. It is such an interesting balancing act, and there is no recipe card. However, as I noted, where am I now as I ponder my own personal baggage and where I stand regarding issues of equality and justice? Perhaps the most important thing to occur in the approximately-a-year I’ve been accepted as a member of the Galán family is foundational because it has provided an indescribable opportunity for me to consider my racial bias, a bias that it pains me to admit, but one I must confront if I am to understand it and then change it. It is something that I am working on. It is something that being opened to has forced me to finally recognize how deep-seated it is. I am grateful to be learning this. I pray that I can continue to learn to accept people for who they are and the gifts they bring rather than for what I expect or hope from them. Melissa and José, thank you for coming to see me Sunday morning. José, thank you for your words. Melissa, thank you for your presence. Off to the office to start a new semester; to my various surrogates, I wish you a successful semester. If it is your last one, hang in there; you’re almost there. For those who made Dean’s list last semester, I only have one thing to say. Do it again. To the rest of you, good luck with your semester, be it here in Bloom or somewhere else. If you have not seen the movie Selma, do yourself a favor and go see it. To everyone else, thank you as always for reading. The comment about not thinking they are different is an excellent one. It really does go to the heart of white privilege that I think, “They are like me.” as though that is a gift, condescension maybe I am bestowing on them. It does not serve them or me very well when I go there with my thoughts. May I remind you, your great grandfather, Haman Martin, was a patriot in the Civil War,fighting the entire four years with the 47th Indiana, Infantry, Co. C and G and participated at the seige of Vicksburg? He lived the rest of his life with health consequences due to his service. May we never forget. Thanks for your responses. Indeed, through our country’s history people have stepped up to speak out against injustice and prejudice. Thanks for telling me about our relative, Diane. Most of my post is pointed at my own shortcomings. I believe in our fragility as humans, we could all do better in our acceptance of the other. On the other hand, I know that personal experiences influence our perception and our ability to do so. My careful thought about my own actions is one way I hope I might do better, be better.